As a professor in a Catholic university, one encounters the rollercoaster ride of our students’ maturing faith life. 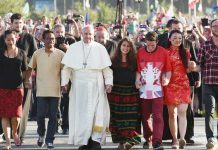 There is no doubt that when a young person leaves the safe haven of his or her home environment and enters the world of serious academia—with its religious and cultural diversity and cacophony of religious attitudes or dispositions—questions arise that can lead to an inner awakening for redefining a personal relationship with Jesus and the Church. This is normal! For some young people, this is a desert experience. Some students may feel their spiritual lives being shaken when the black-and-white answers of the past collide with a diversity of religious perspectives. Some react against the religious life they have come to believe because they perceive that it isn’t really religious but “supernaturalistic”—a religious life not connected with their lived experience but a kind of superstructure that does not speak to their present situation. Others discover that their new freedom to explore other traditions is a fresh, religious awakening with questions never before posed in their religious formation. 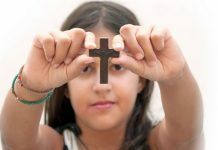 While some parents may panic, we realize this time may not be a real crisis of faith but rather an opportunity for the young person to reconfirm what he or she believes from a deeper, more informed, and personal perspective. It may not seem an easy path to navigate unless one has the spiritual support of a campus ministry team, present and attentive 24/7. Fortunately, our university has a great campus ministry team. There are students, however, who desire to navigate through their experiences alone or with a few friends or by connecting through select faith blogs, chat rooms, Facebook, or more. If these alternative faith dialogue partners are grounded in a profound relationship with Jesus, students have a solid platform for their struggles with ambiguities. If not, their struggles can only deepen and become more complex because of the haziness, ignorance, or limited faith commitment of the dialogue partners. In his apostolic letter Porta Fidei, Pope Benedict XVI writes: “Whereas in the past it was possible to recognize a unitary cultural matrix, broadly accepted in its appeal to the content of the faith and the values inspired by it, today this no longer seems to be the case in larger swathes of society, because of a profound crisis of faith that has affected many people” (n. 2). The Holy Father points out the many concerns within our secular cultural context that distract us from being “fully conscious of the grave difficulties of the time, especially with regard to the profession of the true faith and its correct interpretation” (PF, n. 5). Let’s spend some time reflecting on this reality to grasp its breadth and depth. We should not be afraid to face the problems of faith that are emerging around us. However, are we prepared to do this? Perhaps we have become too comfortable with simplistic answers to complex spiritual realities. Perhaps we have not allowed ourselves quality contemplative reading, study, and reflection to capture the breadth and depth of religious knowledge and contextual understanding to face the faith challenges of the twenty-first century. Yet, faith has to be rethought within contemporary circumstances. Now more than ever, our vision of the world, of humanity, of anthropology—even diverse anthropologies and visions of humanity—are challenging us each and every day. We experienced this in the past year when we were faced with the vast political issues that called for stances of faith for defending and respecting the dignity of the human person. Media have created a world of nanosecond communication with a cacophony of religious and spiritual opinions, perspectives, and behaviors. The acceleration of change in cultural and social life is becoming a trigger igniting queries about the relationship of faith and life, the relationship of faith and reason, and the interpretation of faith for being authentically human in a changing world. There is no doubt that to believe is a risky adventure. Yet, we need not be alarmed. Our times call for a profound and mature faith; a faith that is courageous in the face of copious questions and challenges arising from our students’ lived experiences; a faith that is willing to listen faithfully by listening deeply to the questions beneath the stated questions or comments to discover the movements of the Holy Spirit. This is our catechetical task. Father Gustavo Gutierrez wrote: “…in the first place, let’s say that to speak of ‘faith’ is an abstraction. What exists in reality are people who believe, people who have a faith, that is, people who accept the word of the Lord.” The center of faith is the conviction that God comes to the world by means of Jesus Christ—not as an abstract God, a philosophical God, a conceptual God, but an active revelation of God. By prayerfully reading and meditating on the gospel stories and New Testament accounts of the faith of the early Christian communities, we come to know who Jesus is and what Jesus calls us to become. We discover that our hearts are burning with a deep desire to embrace the path of discipleship, the Jesus way of life that leads to beatitude living. Jürgen Moltmann once called attention to the danger of “little faith,” or the dwarfing of faith. He understood “little faith” to be found where people were afraid of freedom and lacked courage, were suspicious of one another and the world, and were willing to stand back and not embrace a more robust and intentionally lived faith. Those with “little faith” seem to abandon the faith; thus, we may hear “I am going to leave the Church, explore another religion” or “Everyone I know seems to be abandoning religion all together and embracing a more personal, individual spirituality.” In this spirit, those with “little faith” sense that only a small remnant of the faithful will remain in the future. Perhaps this attitude is what most threatens faith today. Cardinal Joseph Ratzinger (Pope Benedict XVI) frequently wrote about the many risks of having faith in the modern world. He saw a danger that faith could retreat before the world so as to feel secure within itself, so that it cannot be attacked by anyone. Or, an opposite yet also dangerous position could be that one sees how mere piety uprooted from the world is useless and that faith lived in the Church does not correspond to the call for living and witnessing the gospel within our immediate cultural contexts. In this context, faith becomes a purely political activity. Here faith can become secularized, losing its face and identity. We find recent Church documents articulating a double crisis of faith: the crisis of relevance and the crisis of identity. The crisis of relevance is sown in the fact that many Christians today don’t know why they should believe or how faith could change their lives. It seems as though, for many, to believe or not to believe—in a Christian sense—would change nothing in their lives, so why believe? Yet, if we strive to make the Church more relevant in society, we risk being engaged in the Church from a simple human perspective—not from a faith perspective. So what difference does faith make? Here people begin to fall into the crisis of identity. We begin to hear people ask, “Why am I a Christian?” “Why do I need faith?” “Can’t I live the Beatitudes perhaps even more assertively than those who state they believe in a beatitude way of life yet don’t witness to it?” An authentic conversion to Jesus Christ opens the door of faith. If our faith is concentrated in the person of Jesus Christ, we become disciples who concentrate deeply on the origin of faith, on Christ himself. But what do we understand when we say or imply the word God and/or Jesus in our conversations? Have these words become like “ciphers” that no longer say or mean anything to our contemporary world? This is why the Holy Father has proclaimed a Year of Faith. He invites us as catechists to be new missionaries in a new age. 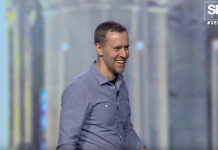 He calls us “… to rediscover the joy of believing and the enthusiasm for communicating the faith. In rediscovering his love day by day, the missionary commitment of believers attains force and vigor that can never fade away. Faith grows when it is lived as an experience of love received and when it is communicated as an experience of grace and joy” (Porta Fidei, n. 7). As catechists, we need to identify new methodologies to reformulate how we communicate faith in these changing times. This is not an option! It is a serious mandate rooted in our Catholic tradition. We need to recover Christian values that are at the heart of Catholicism and speak to modern times while remaining grounded in the richness of our Tradition. We need to reach our young people with a faith that proclaims truly Good News. All too often the Good News comes out as an ideology or theological construct that is restrictive in regards to salvation and not redeeming grace. Yet, Christianity is about great joy! The word joy can be found over 256 times in Scripture, and Pope Benedict XVI frequently speaks about joy in his apostolic letter for reinvigorating faith within our faith communities. In the beautiful post-synodal apostolic exhortation titled Verbum Domini (“Word of God”), the Holy Father desires to “point out certain fundamental approaches to a rediscovery of God’s word in the life of the Church as a wellspring of constant renewal” and hopes that “the word will be ever more fully at the heart of every ecclesial activity” (n. 1). 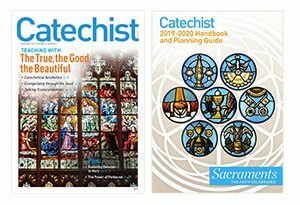 By studying this document in one hand and the Scriptures in the other, catechists are enriched with the power of the word to inspire, motivate, and encourage students to come out of the desert courageously and enter the door of faith that offers the fullness of life. We help them understand that the Scriptures are the living word that speaks of the presence of God in our lives and the world today. Within the Scriptures, we draw living waters that heal, refresh, and give new life. Cardinal Ratzinger, now Pope Benedict, believes that the future of the Church depends on forming concrete, visible communities that are profound and vital witnesses to the Christian experience. These small communities (parishes) will reflect a new way of being dynamic, living, prophetic communities of faith. Yet, these small communities should not lose their catholic (universal) character; they should not stand alone and degenerate into sects and cease to be churches. This could be the danger! We see these same thoughts reiterated in the apostolic letter, as the Holy Father encourages us to strive to rediscover ways to incarnate and make our faith communities into living encounters with Christ. Our primary task today is to rediscover our faith, cultivate a dynamic living faith community, and welcome and embrace those from desert experiences into a community of living waters. Sr. Zukowski, MHSH, DMin is the Director of the Institute for Pastoral Initiatives and a professor in the Department of Religious Studies at The University of Dayton. She is a national and international speaker and consultant for adult faith formation and digital ministry resources. Sister Angela Ann Zukowski explores the desert experiences of faith that a growing number of Catholics are experiencing today. The media has only amplified the issues and challenges the Church is facing. These are not easy times, but neither are they times for us to give up faith and hope. It is time to demonstrate and profess profound faith in the person of Jesus Christ. Jesus is the center, the heart of what we are called to believe and live today. We cannot give up hope but must become professed believers of joy! As we witness our faith commitment, we invite individuals to come out of their deserts to experience living waters within vibrant faith communities. 1. When have I listened to students, friends, or family members express their desert experiences regarding faith? How did I respond? 3. How is my parish becoming a welcoming faith community for those who are struggling with faith issues? How is my parish different from other parishes in similar situations? Or, what recommendations do I have for my parish for being more pastorally creative in addressing faith issues? 4. What are my greatest fears when I think about someone coming to me with their faith crisis? Why? 5. What is my assessment of the way the media facilitates crises of faith within our culture? How might I prepare my students to deal with the challenges posed by the media? 6. What does Fr. Gutierrez mean when he says that “to speak of ‘faith’ is an abstraction”? 7. Have I ever experienced “little faith” in my parish? What does it look like? How do I respond? 8. Do I see the crises of relevance and identity in my life? In the life of my students? In my family? In my parish? What does it look like? How do I address it? 9. Can the words God and/or Jesus become like “ciphers” that no longer speak to our contemporary world? What does this mean? What does it look like? How can we address it? 11. How might catechists ensure that they are inspired by the power of the word to motivate and encourage students to come out of the desert? 13. What questions do I continue to have about the focus of this article? How can I address them? 14. How does this article help me appreciate Pope Benedict XVI’s call to the Year of Faith? 1. Discuss with your students the meaning of desert experiences of faith. 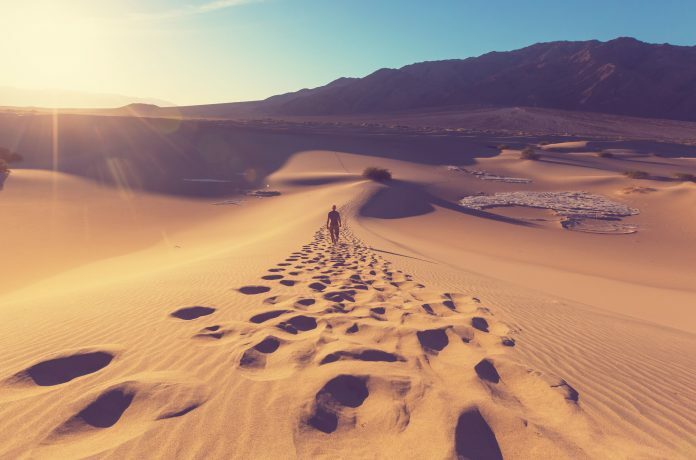 If you had them draw a faith line based upon the first article of our series, now have them identify when they’ve experienced desert experiences. What was the feeling, sense, or thoughts that were associated with it? With whom did they share their experience? Why? Why not? What was the outcome of the shared experience? How could the sharing have been handled differently today? 2. Have students create collages of factors within contemporary culture that may challenge the role of faith today. Have students present their collages to the class with related questions for identifying creative pastoral solutions. 3. Invite students to create a Good News e-newsletter that identifies various faith crises that might exist among their peers. Be sure students compose their articles or news items around positive, proactive ways to addresses these questions or issues. Have them share their Good News e-newsletter with another class. This could be the bases for an inter-class conversation. 4. Discuss with students how they can become faith investigators within their local communities. It could be based upon the CIS or NCIS television series. Over a few weeks, have them “investigate” what factors within their local community can create or stimulate faith crises or enable faith to be strengthened for creating communities of justice and peace. Students might create a public television news segment around their findings or produce an iPod news program to be placed on the parish website. 5. Have students design a door of faith for the Year of Faith. This paper door might be designed to fit on the surface of either one of the church inside doors or within the school. It should highlight how the parish or school welcomes all into their living community of faith. The images may illustrate how the parish is a welcoming life-giving community of living water. The clergy in the parish could integrate the students’ ideas into a particular Sunday homily. Or, before the liturgy begins or ends, invite students to come forward and explain their door of faith. 6. Invite students to write welcoming letters to those who may be struggling with their faith. They could share their own experience of faith as being salt and light within the community, or why they believe in Jesus. These letters could be posted throughout the year on the parish website or in the parish bulletin.